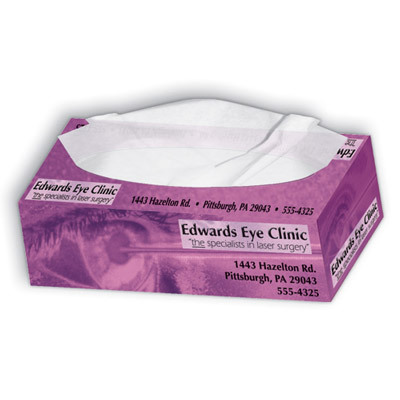 Personalized Tissue Box Custom Printed in Bulk. Promotional, Inexpensive. with 80 tissues. Budget Prices in the USA and Canada. Wholesale advertising Tissue Box on sale. Lowest cost in North America. Free Artwork Design. American Clients pay no taxes. • Tissue count: 80 tissues. Approx. Dimensions: 7 3/4" x 4 1/8" x 1 3/4"